Basic tips and ideas on taking your family and kids on a road trip or off-road adventure whether it is in a tent at a caravan park or a remote 4WD (four wheel drive) adventure. There is nothing more exciting than embarking on an adventure, whether it is a short weekend away, a road trip or an epic four-wheel drive tour. Australia has so many exciting things to see and do and here are some ideas on how to go about planning and preparing yourself for an expedition that you and your family will remember forever. One of the great things about living in Australia is the fantastic places you can explore, whether it be somewhere close to home or a remote adventure. A weekend away camping or a small road trip doesn’t require a lot of preparation however the further from home and more remote you go, the more important it is to be organised and prepared for just about anything. Our trips always generate excitement way before departure date as we research where to go, what to see and where to camp. When you are on the road, it may be challenging to find all the information you require so knowing where you are going, what facilities and accommodation is available can make trips a lot easier. The Internet is a great resource and there is plenty of information available as well as forums to explore, together with books and maps, you can generally find all the information you need. Calling ahead to tourist and information centres to see if special permits are required and what facilities are available such as access to fuel supplies and opening times for stores and petrol stations can be beneficial. This becomes more important the further afield you go because services can be hundreds of kilometres apart. 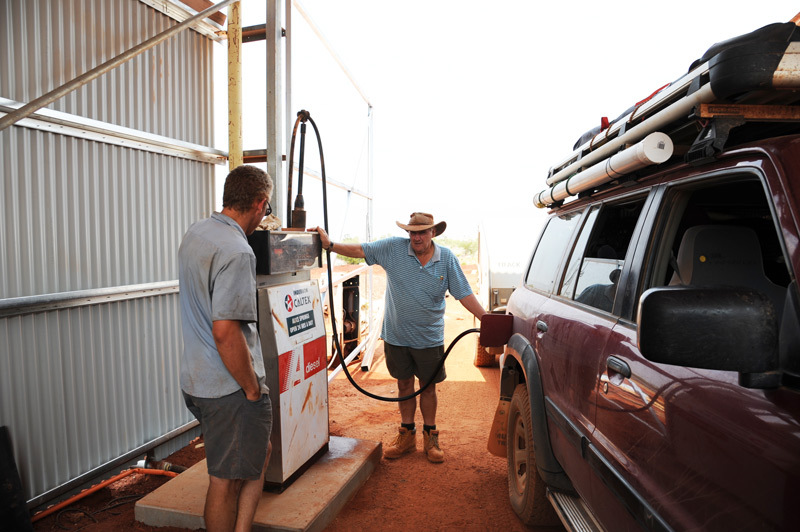 Be prepared to pay whatever it takes to fill up your car because if you are paying over $3 a litre, you are generally in a pretty remote location and it probably costs the reseller a small fortune to get the fuel transported there. Checklists are helpful in preparing for a trip as they take the stress away from remembering everything and you can get a clear handle on what you have packed and what you need to buy or do before a trip. Start getting ready well in advance, ensure your car is serviced and that you have all the equipment you need, that it is in good working order and you know how to use it. Having an organised car and a system of packing and storing all of your gear becomes critical the longer you are away and the more equipment you are carting. We have fabricated our own drawer system and fridge slide to accommodate our two fridges as well as easy to access food boxes. For anyone that knows me, I am the queen of labelling and I love nothing more than getting out my dymo labeller and giving everything a designated spot. When you are on the road for weeks, it makes life a whole lot easier and I hated rummaging through the drawers trying to work out where my food was. Now it is much easier as I can find exactly what I want and restocking is much simpler. We have a system of packing the car where everything has a designated spot so we know where to find it. Emergency equipment such as our satellite phone is in a bright orange case so it is easily seen and we store it with the first aid kit in an easy to reach location, so we can access it easily and quickly. The equipment you require for road trips will depend on where you are going, where you are staying and how long you will be away for. If you are staying at a holiday village or accommodation provider, you are not going to need anywhere near as much gear compared to if you are remote camping. Having a basic itinerary will help guide the packing process as you might be staying close to a town or store where you can restock on food. If it’s been a long time between trips or your first camp experience, practice setting up your tent and check to see if it is clean and you have the necessary poles, fly and pegs. Ensure you have adequate safety equipment and that you know how to use it if you need to.